On June 9, 2004, at approximately 2110 mountain daylight time, a Cessna C172P, N9474L, operated by the New Mexico Wing of the Civil Air Patrol (CAP), was destroyed when the pilot attempted to make a go around at Las Cruces International Airport (LRU), Las Cruces, New Mexico. The private pilot received serious injuries and the passenger received minor injuries. Night visual meteorological conditions prevailed. No flight plan had been filed for the cross-country flight being conducted under the provisions of Title 14 CFR Part 91. 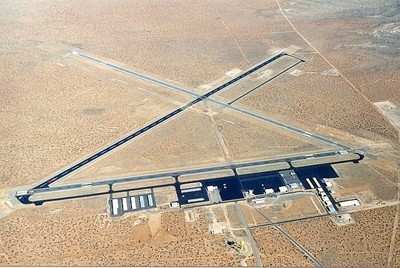 The flight to Albuquerque, New Mexico, was originating at the time of the accident. According to the accident report submitted by the CAP, the airplane had just departed LRU when the low voltage light illuminated and the pilot returned to LRU. The pilot transmitted on the Unicom frequency that he was “turning base to final for runway 26” but was actually turning base to final for runway 22. The pilot of another CAP airplane heard this report and elected to take off on runway 22. The pilot of N9474L sighted the other aircraft on the runway and made a 360-degree turn for spacing purposes. During the turn, the airplane struck large mesquite bushes and collided with terrain. The nose wheel was severed, and the airplane nosed over and slid into a fence. The engine mounts were broken, the wing struts were bent and the vertical stabilizer was crushed. The pilot sustained broken bones. Prior to the flight, the accident pilot had performed three take-off, landing and taxi back procedures to renew his night flight currency for carriage of passengers. (49 CFR Part 61.56) His last night flight was on September 1, 2003. According to the report, the pilot had flown for 6.9 hours on the day of the accident. Be the first to comment on "Civil Air Patrol Pilot Error Destroys Airplane"